What’s it like to oversee a busy coffee company’s lifeblood—the roasting of the actual beans? 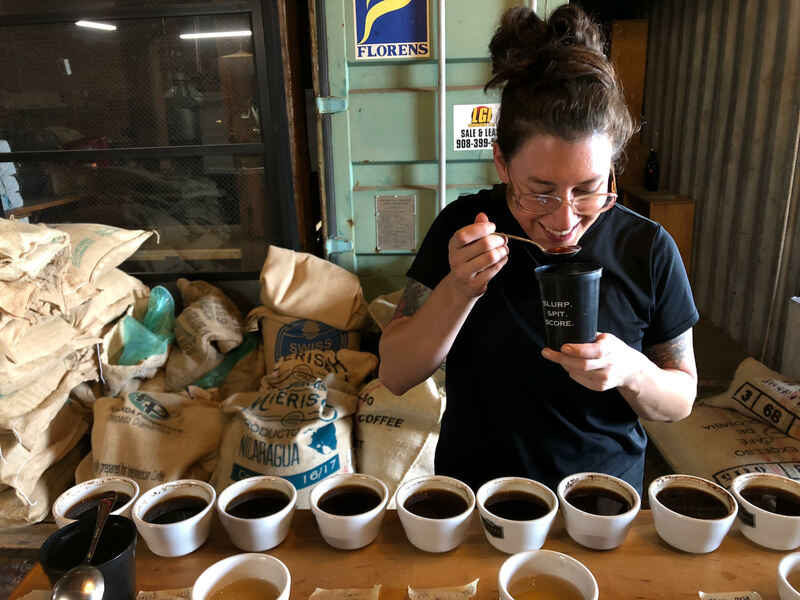 Amaris Gutierrez-Ray is Joe Coffee’s Roasting Operations Manager, a job that calls upon everything from paperwork to palate to, of course, heavy lifting. Here’s what a typical roasting day looks like for Amaris. 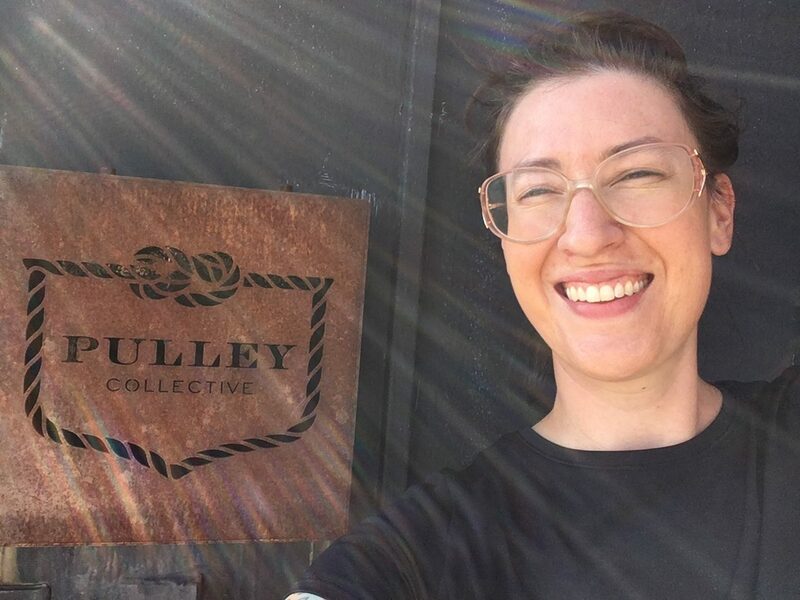 I start roasting coffee Mondays and Wednesdays beginning at 6:00am, but my Thursday shift is a small luxury in my week: it starts at 11am, so I can get in both a little extra sleep and also a morning yoga class before heading to our roasting space at the Pulley Collective in Red Hook. I have a beautifully easy downhill bike ride from where I live in Sunset Park to the yoga studio in South Slope, and after class I can coast down another hill straight to the Liberty Warehouse pier on the water in the sunshine. As I ride I think about the comment my yoga teacher made on how yoga, as a metaphor for life, involves directly engaging with facing or feeling discomfort, and that rings very true today as I take off my helmet and walk into the waterfront warehouse where we roast. On hot days, we maximize cooling by keeping our front doors and back bay open, and employ a strategic frenzy of fans to bring in breezes off the water. But that’s all we have in terms of climate control so summertime is one giant opportunity to learn from ourselves and engage with discomfort. 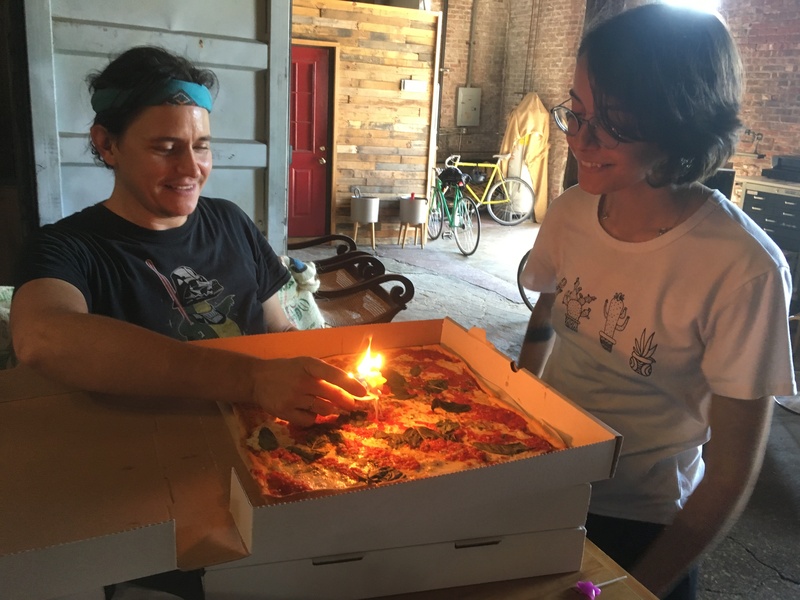 On a normal Thursday I jump straight into setting up our production cupping, but today is Production Roaster Roberta Duarte’s birthday so I sneakily sidle up to Jake Kirkpatrick, Production Operations Manager, to confirm he’s ordered birthday pizza, which we present to her with a not-very-stable candle. We work in a somewhat isolated part of Brooklyn, with the nearest lunch option being the Fairway across the mini-peninsula, so the whole team is pumped to have pizza today. 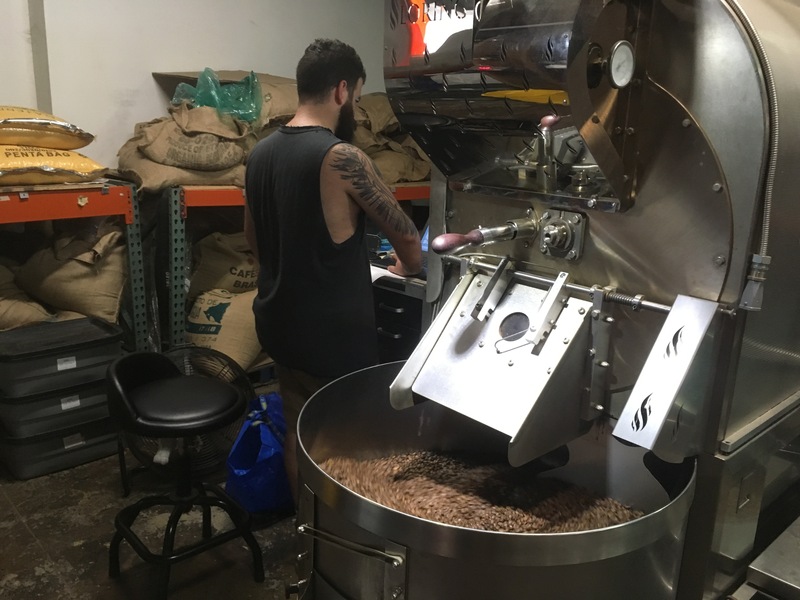 Mid-day here is the beginning of our Thursday symphony: many moving parts weaving in and out, with Jake and Lee Harrison, our Director of Roasting, at hand in case tempo dies down and they can help step it up. The production closers haven’t started yet, but most of the team is here already and is packing retail on the two weigh-and-fill machines, and just getting started filling up 5lb bags with a massive automated bulk bagging machine. Greg, our Shipping and Receiving Lead, is knee-deep in packing the mail orders, and Roberta and Liam Berkowitz, our other production roaster, overlap for an hour during shift change on the Loring and start to fill 25lb bins of our Waverly espresso for stores and line them up so they’re ready to pack into vans later for tomorrow’s deliveries. 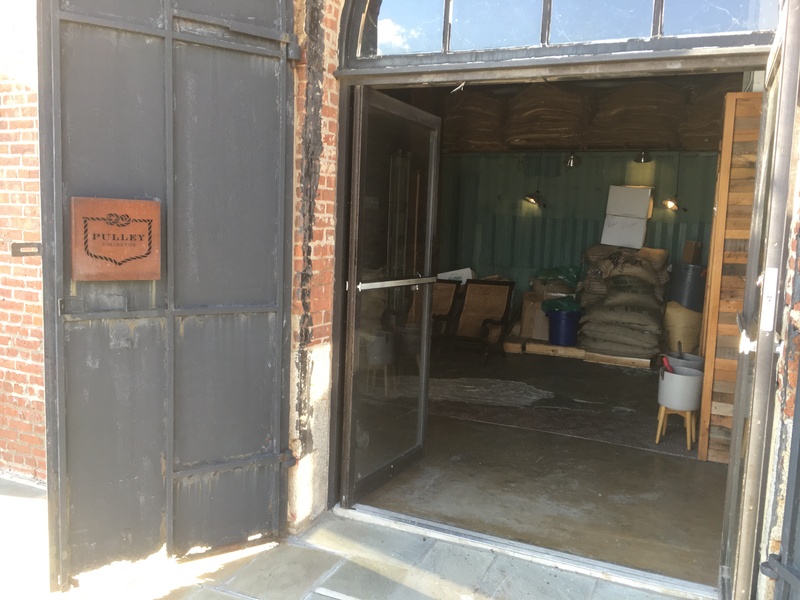 After pizza shenanigans, I check in with the roasters because the logistics company we use didn’t bring our full delivery of green coffee yesterday from Continental Terminals, a special climate-controlled coffee warehouse in NJ. We have a light day today, not quite 3,000lbs ordered, so after checking our inventory and comparing with what we need, I let Ed Kaufmann, our Director of Sourcing, know we have enough Nicaragua Placeres to fulfill today’s orders for The Daily house blend, but we’ll need that other pallet and a half tomorrow so we can get through Monday. Production cupping is next, and with 23 samples on the table we have a lot to taste. We’re searching for ways to tweak the Daily’s components to get more sweetness in the cup, so we have four samples each of experimental batches of the Guatemala El Morito and the Nicaragua Placeres. After lining up the table cheese-board style (least to most acidic), I weigh out 12.5 grams of each and set them aside, set two kettles to boil, and while the water starts to heat up I catch up with Lee to make sure we haven’t overlooked any daily to-do items. This past week we sampled a new coffee for cold brew kegs and bottles and we also need to make sure we all know the timeline of roasting and shipping samples to this year’s Good Food Awards. When Andrew Oberholzer, our Head Roaster, has finished his opening shift roasting on the Probat, he helps me grind individual samples and hit them with boiling water. 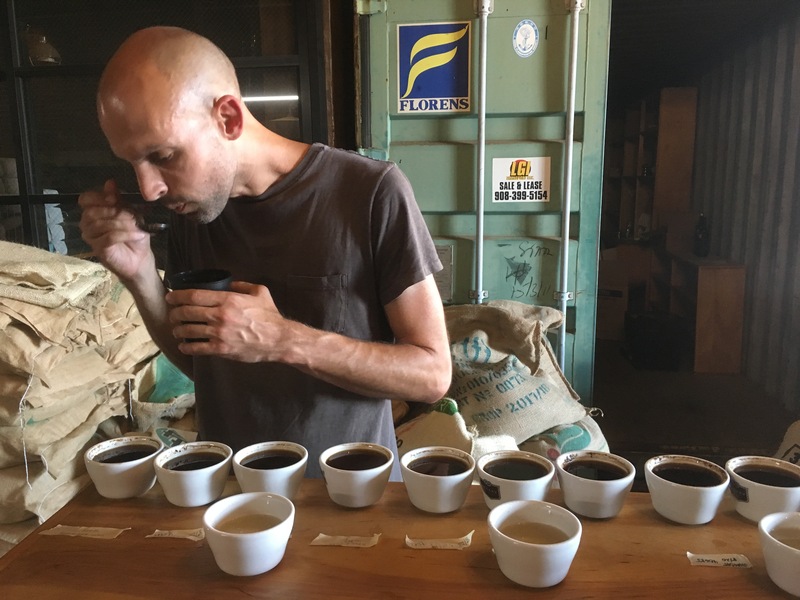 After doing a couple passes to taste, Liam takes a quick break from roasting to join us, and we analyze our roast data to find out where we attained the targets we were hoping for and identify where we can improve. We update a couple profiles after discussing the cup qualities in the Daily samples, I clear the table, and then the roasting half of my day begins. Each roaster has a “home” machine, and mine is Pulley’s vintage German Probat, although I can also operate the modern, energy-efficient Loring. I weigh out 40 green pounds of each coffee, pour into the well that vacuums the coffee up into the hopper above the roasting chamber, and then when the machine is at the right charging temperature, I pull the hatch and the coffee is released into the drum. This little ritual gets repeated many times over a few hours, and then finally once orders are fulfilled with some elbow room, I set the Probat to cool down. While it’s cooling, I clear the chaff, sweep the area, scoot the last coffee bins down to the production area so the closing PAs can weigh the surplus, and then do a full count of every last bag of green we have (including empties) so I can send our order for next week’s green coffee delivery to Ed. If I have any time left over before the machine finishes cooling down — and I nearly always do in summertime because of the heat — I can look ahead to next week and catch up with email. I make sure the samples we need for our QC session at HQ next Tuesday have made their way to Chelsea, I start reviewing and organizing the data from our tasting sessions so I can write this week’s QC report, I chip away at reading some coffee-related articles, I plan out some topics to discuss for our Roaster Staff meeting in a week and a half, and make sure the dishwasher is started so the cupping bowls will be clean for whoever roasts at Pulley tomorrow. Meanwhile, production assistants are playing some wind-down music, loading the vans strategically based on tomorrow’s projected delivery route, and sweeping up the production floor. Before I know it the Probat is beeping at me to say it’s finally cooled down. 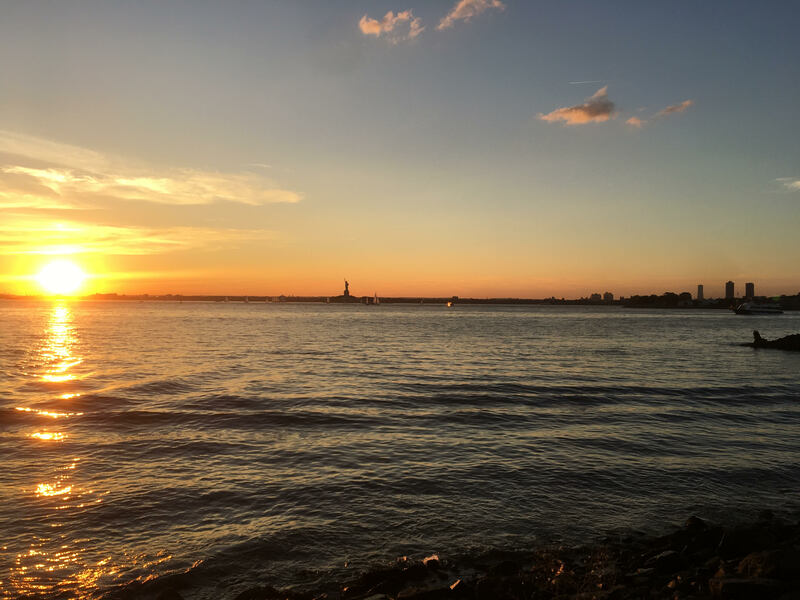 Liam is wrapping up, too, we have a little end-of-day catch up, and then I spend a minute outside putting my helmet and biking gloves on, sharing a sunset moment with Lady Liberty out there in the fading light.